Today is a day to celebrate L-O-V-E. We can have a lot of loves in our lives, but if we don’t know the Lover of our souls, we haven’t yet known what it is to be truly loved! There is nothing that can compare to the L-O-V-E that Jesus has for us. Take some time today to whisper “I love you” to the Lover of your soul. He is waiting to hear your voice, and even more so, He is waiting to hear your heart. Below are the lyrics to the song “Oh How He Loves.” It is a beautiful love story between God and His children. Read it slowly. Take time to feel the emotion in the words. Grasp their meaning. Are you a tree, bending beneath the weight of His wind and mercy? Do you realize how beautiful He is? Are you drawn by the grace in His eyes? If you have time, pull up a YouTube version and listen to the David Crowder Band sing it. 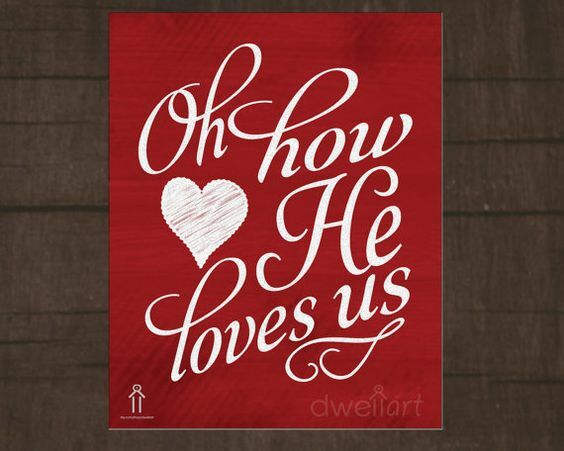 And, oh, how He loves us, oh.